I’m calling it: Jack Layton has jumped the shark. OK … maybe many others have called it earlier (if even by a few days), but there’s no going back from the mess that Jack Layton has created for himself and I’m going to pile on to that point of view. Suggesting that the NDP can’t be blamed for the death of the gun registry is akin to saying that your heart doesn’t help your blood flow. For those of you looking for a solution to the Gun Registry situation, Scott Tribe posts a compromise recommendation for Jack and Michael to consider. However, I am concerned that Jack will continue to play games with Stevie as opposed to creating real solutions that all Canadians will be proud of. 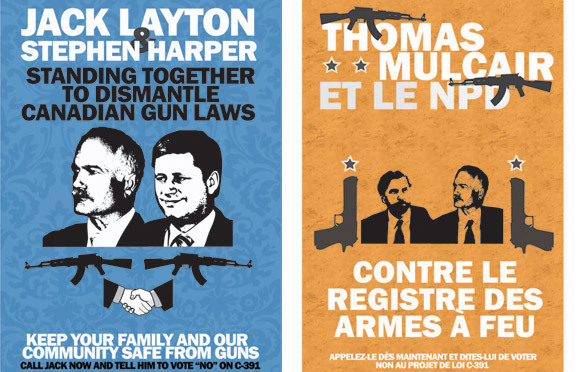 The image above reminds us that Jack Layton has been working to keep Stephen Harper in power for some time, not just as a result of the gun registry, but ever since he got bluffed by Stephen Harper into making a grab for a few more seats in 2006 and helped defeat Paul Martin’s Liberal government. As Jack Layton or members of the NDP continue to prop up the Conservatives, it’s becoming more and more apparent that the ‘socialists’ are just henchmen for the Cons. Failing to differentiate the NDP from the most right-wing organization in Canada is a massive error and will cost the NDP dearly, both in terms of financial and voter support. Their efforts to find concession will result in the Liberals being seen as Canada’s only progressive option. Jack Layton needs to stop looking at the Liberals like they’re competition. Jack Layton needs to start developing a plan for getting rid of the Conservatives, including concerted marketing effort across all opposition parties (including the Green Party) to remind Canadians that coalitions, even including separatists, are OK.
Jack and Michael need to work together to defeat the Conservatives at every turn before the DNA of this country is turned to mush (although it may be too late for that). They should figure out every possible political angle they can to maximize the number of seats that they can get in the next election, including the removal of candidates in key ridings. If Jack fails on this, the urban population will dump the dippers in droves and the NDP will be caput. If the NDP survives this, there should be a leadership review for the NDP, but we know that will be pointless because the NDP is run by the unions and individual members will be shut out. As such, the NDP is done as a party in Canada. The Liberals know it and they’re distancing themselves in a big way from the NDP politically and likely in the polls as well. All of this brings us back to why Stephen Harper will be in control for a very long time. The Liberals and NDP refuse to play nice and bring the government down. They are sworn enemies and will do anything to avoid concession, including returning democracy to Canadians. Because Jack and Mikey won’t be able to play nice, we’ll all be screwed by Stevie. Merger Madness: Should the Liberals Just Disband? Amid the talk of merging two extremely inconsistent parties, I have another suggestion: the Liberals should consider disbanding. The Liberals have been on a downward swing for a number of years, arguably decades. The leadership through the 1990s was either self-indulgent or slashed at federal budgets more than any tight-fisted socon ever would. In today’s state, they’ve failed to differentiate themselves when it comes to policy. They either side with the Conservatives or they have nothing. Their current leader is a putz. Just because he’s sitting low in the polls doesn’t mean it’s time to take a break when it comes to breaking up the potentially devastating pile of steaming turd called the 2010/2011 fiscal budget and omnibus bill. You could have supported the budget, but you didn’t have to eat all of the crap that came with it. In fact, we are dealing with the most corrupt and irresponsible government Canada has ever seen and both the Liberals and the NDP are enabling them to exist. Their legacy has faded into a waft of self-delusion and aristocracy. There was nothing democratic about the crowning of Sir Michael. There was no effort to engage Canadians in the process. There was only an effort to disengage from someone who was actually a really decent Parliamentarian (Dion). Of course, from a party perspective, are there other options? Are the NDP under Jack Layton any better? Brad Lavigne argues that they’ve done substantially well and he’s correct. The only problem is that Jack is busy selling off his union card in exchange for a Canadian Taxpayer’s Federation subscription, doing everything he can to keep the current socon crowd afloat. I’m frustrated because my options have run out. You could argue there’s the Pirate Party or the yellow socons called the Green Party. Realistically, neither of these are realistic choices. All I want to do is defeat the Conservatives.